Welcome to the Seacoast Women’s Hockey Association (SWHA) Seacoast Spartans Girls Hockey Program. The Spartans are committed to developing well rounded student athletes for their futures in and out of the sport of hockey. 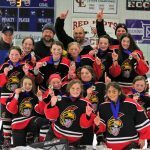 Our teams range from the ages of 8-19 years old and participate in the highest levels of Elite girls hockey in the Northeast. To get more information about joining any of our teams please contact us at girls@seacoastspartans.com (ask us to join any of our teams for a free introductory skate! ).